Is there hope for IPv6? The ongoing competition between IPv4 and IPv6 has big implications for the future of the internet. 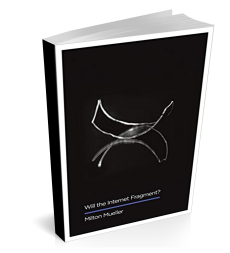 Is this mixed-standard Internet a passing phenomenon, or will we get stuck in it? If it is only a transitional phase of a standards war and one will prevail, which one will it be? If IPv6 prevails, how long will it take us to get there? Is it possible that IPv6 actually loses the standards competition, and becomes the proverbial ‘orphan’ of the standards economics literature? Our report tries to answer those questions. We are still vetting the draft report but can release some initial findings. The largest group, 169 countries, or 79% of the total, had no appreciable IPv6 deployment, remaining at or below 5% during the entire study period. The next largest group (26 countries, or 12%) were economies with increasing levels of IPv6 capability. 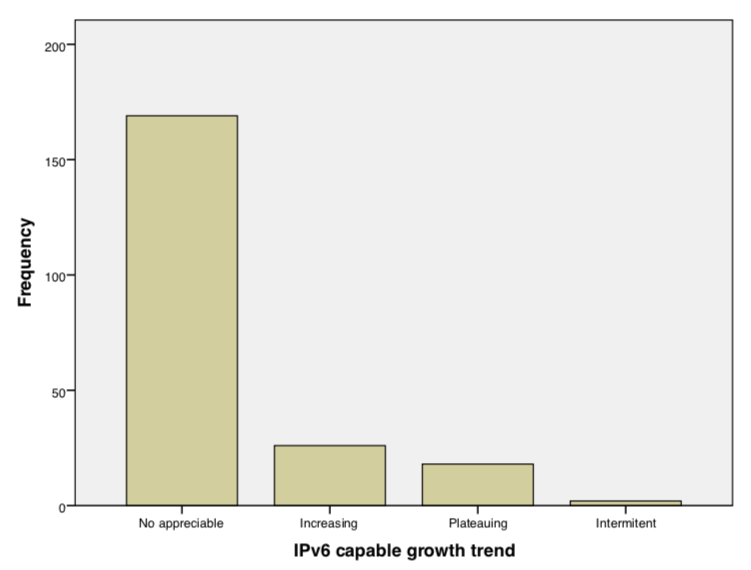 The next group (18 countries, or 8%) exhibited a plateau in growth, with IPv6 capability growth stopping at levels anywhere between 8% (Austria) and 59% (Belgium). Even in countries where major network operators have converted, there are plateaus in the level of deployment for a period of two or more years rather than a steady, increasing march towards additional deployments. The full report explains in more detail why these plateaus happen. How to explain this pattern? Among these viable alternatives, we show that dual stack will never get us across the finish line; it is not economical. It is the third category that shows promise for some growing networks. We also show that there is no difference in the network benefits obtained in all of the three options; all three approaches gain access to essentially the same Internet. Consequently, one network operator’s migration to IPv6 places no pressure on the incentives of other network operators to deploy IPv6. There is also no discernible difference in the Internet service offered via IPv6 and IPv4. Furthermore, the costs of maintaining compatibility between the two standards are borne exclusively by networks that deploy IPv6. Deployers must make one-off investments in infrastructure and training, and incur ongoing compatibility costs, whereas non-deployers only have to pay for additional IPv4 numbers. (And if non-deployers don’t need to grow they don’t incur any new costs). Because of the additional costs associated with IPv6 deployment, there is a strong positive correlation between a country’s wealth (measured in per capita GDP) and country-level IPv6 deployment levels. Per capita GDP differences explain nearly half (.499) of the variation in IPv6 deployment levels across countries, and the correlation is statistically strong (<.01). The study also found that a lower level of market concentration (as measured by HHI) is correlated with higher country-level IPv6 capability rates. This was true of both wireless (-.267, p = <.01) and fixed broadband (-.347, p = <.01) service markets, though the correlation is stronger in fixed broadband. It is well known that competitive markets accelerate investment in newer, more efficient technologies. The problem in this case, however, is that we found no correlation between IPv6 deployment by a network operator and changes in its market share, so the negative correlation between market concentration and IPv6 deployment is not a product of competitive advantage. It probably exists for two reasons: 1) the presence of more players in a market increases the likelihood that one of them will make an arbitrary deployment decision; 2) a more open market permits the entry of new firms (such as India’s Jio) with newer infrastructures, which have a more favorable cost structure for IPv6. The good news for IPv6 is that it can make economic sense for some operators who need to grow. The bad news is that many networks don’t need to grow much. And even if they need to grow, they may still be lodged in a slower-moving software and hardware ecosystem tied to IPv4, which will make it less expensive to expand by just obtaining more IPv4 addresses or using NAT. Additional bad news is that the need to maintain backwards compatibility with non-deployers eliminates any network effects that would create growing pressure to convert to IPv6. Not until the very end game, when the number of IPv4-only networks is so small that the older protocol is in danger of being shut off entirely, is there any external pressure on lagging network operators to convert. We will do additional modeling to gain a better understanding of end-game timing and scenarios. The final report will come out near the end of this month. I look forward to the report! You seem to be pretty much on-track with the views that are emerging in IPv6 advocacy forums (I tried “fora” but it looked funny). Two pitfalls that most deployment metrics are falling into is that they account for the accessibility of services and resources, but not connectivity, and they count any on-line resource as equal, when they are not in practice. Our services at the University Of Hawaii are behind the curve for IPv6 adoption, but our users’ connectivity has included IPv6 as dual-stack for over a decade. Currently, on our dual-stack campus wireless, where modern BYOD can pick and choose their protocols, more than 50% of content is conveyed over IPv6, since the majority of our users’ requests are to early adopters, like Facebook, Google, YouTube, Microsoft, Apple, Yahoo, Akamai, Cloudflare, and other cloud/CDN. I bristle slightly at “non-deployers only need pay for addresses”, since every network will, eventually, pay for the costs of IPv6 deployment, which most people over-estimate. Thanks for this inquiry, I will spread the word to expect your report. Dear Milton – I am just surprised by the terms you use to describe the migration from IPv4 only networks to IPv6. “The Hidden Standards War”; “standards competition”; IPv6 “losing” the standards “competition”? What are you talking about? There is nothing like a “competition of standards”. There is nothing emotional about needing to move from IPv4 to IPv6. It is a fact that developed country networks are moving to dual stack as a necessity. Major ISPs are migrating their networks. Others are actively redesigning their whole network topology behind the scenes. Most of the work is highly strategic and company confidential. And yes, when a competitor rolls out IPv6, other players in the market start paying attention. Then another one follows suit. And so on, until the IPv4 ISPs start realising they are lagging behind, especially as the next by leap is 5G – and billions in research are being poured into 5G at the moment. We are way past the “do you need IPv6” phase, as operational experience of CG-NAT is showing that it is resource hungry and unsuitable for today’s network management needs. I would be interested in reading your final paper but at present it reads like a headline from January 2014, not 2019. I share Oliver’s puzzlement related to how the standards are positioned in your article, as if the two are pitted against each other. Otherwise nice write up. I wager that the dual stack nature of networks will persist for several more decades. Also why does is seem that every article about IPv6 adoption fails to mention the vastly different security landscape as far as ARP, DHCP, etc.. Perhaps because the discussion is more centered around internet traffic and away from internal LAN’s where the benefit is strongest? Belgium was a non-competitive deployment scenario: all the ISPs were conducted into a conversation with the regulator to agree a neutral deployment. Therefore it is hardly surprising there is no net market share shift. India, the story of Reliance/Jio is significantly different. Its deployment of LTE with Ipv6 clean deployment saw it change market share significantly from 5th or lower, to first place. I’m interested to read the full paper, but I have concerns regarding some of the statements. First of all, I don’t recall a “standards war” at any point in time. You make it sound over dramatic. IPv6 always have been inevitable on the longer or shorter run. Secondly, I don’t think there ever was a correlation between IPv6 deployment and GDP. Examples are Greece (They started IPv6 deployments in a rough time), Portugal (same) and India, as George mentioned above. There are other examples as well. I’m curious to see how you got to these conclusions. Looking forward to the report. The article seems to ignore the fact that IPv4 space has almost run out and CGNAT has real drawbacks, with statements such as: “..no difference in the network benefits obtained in all of the three options..” and “..expand by just obtaining more IPv4 addresses…”. I wonder how the final report will reflect on this. Thank you for this inquiry. 18 years after D. J. Bernstein’s critique in the ngtrans mailing list that most people there got even the basic goal wrong, finally we are able to empirically verify his predictions about the difficulties transitioning into IPv6 would face. Unfortunately, many people still share the same mistakes which has costed the world a swift transition from IPv4: being satisfied with coexistence of IPv4 and IPv6. IPv4 and IPv6 are essentially at war not because the emotion of any participant, but because we need to *upgrade* from IPv4 to IPv6, which means replacing IPv4 with IPv6, which in turn means that the goal should be the elimination of IPv4. As long as IPv4 exists, IPv6 cannot be viewed as *the* Internet. IPv4 also serves as a major disincentive to joining IPv6, since any technical advantage IPv6 has over IPv4 is offset by the abundance of sites and services IPv4 has over IPv6. Their raison d’être directly oppose each other and their existences depress each other. To be satisfied at coexistence of IPv4 and IPv6 is as much a mistake now as it was in the ngtrans mailing list. So is thinking such coexistence would naturally lead to the eventual replacement of IPv4, which leads to such complacency. It is 15 years from the first deployment of production IPv6 to now. That’s exceptionally long for the Internet. IPv4 itself only took 30 years to grow so large as to exhaust its own address space. IPv6 has taken half of that time to reach about 1/4 of its size, with various data pointing to plateauing. 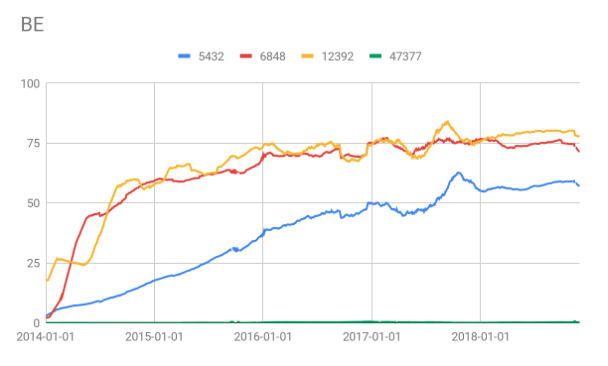 Did IPv6 evangelists seriously expect that it would take IPv6 almost as long (or maybe even longer) to replace IPv4 as IPv4 took to exhaust itself? Because that’s what looks like would happen.